We’d love your help. Let us know what’s wrong with this preview of Blur by Bill Kovach. Amid the hand-wringing over the death of "true journalism" in the Internet Age—the din of bloggers, the echo chamber of Twitter, the predominance of Wikipedia—veteran journalists and media critics Bill Kovach and Tom Rosenstiel have written a pragmatic, serious-minded guide to navigating the twenty-first century media terrain. Yes, old authorities are being dismantled, new Amid the hand-wringing over the death of "true journalism" in the Internet Age—the din of bloggers, the echo chamber of Twitter, the predominance of Wikipedia—veteran journalists and media critics Bill Kovach and Tom Rosenstiel have written a pragmatic, serious-minded guide to navigating the twenty-first century media terrain. Yes, old authorities are being dismantled, new ones created, and the very nature of knowledge has changed. But seeking the truth remains the purpose of journalism—and the object for those who consume it. How do we discern what is reliable? How do we determine which facts (or whose opinions) to trust? Blur provides a road map, or more specifically, reveals the craft that has been used in newsrooms by the very best journalists for getting at the truth. In an age when the line between citizen and journalist is becoming increasingly unclear, Blur is a crucial guide for those who want to know what's true. To ask other readers questions about Blur, please sign up. Probably the best book (other than Elements) that I have ever read to teach journalism students what they need to know about what it really means to be a journalist, even though the book is also aimed at a broader audience of news consumers. Although I'm biased since I used to work for Bill and Tom, I think that what they have done here is tremendous, because it is an artful marriage of the core values of journalism and how to keep them alive with a keen understanding of how journalism is changi Probably the best book (other than Elements) that I have ever read to teach journalism students what they need to know about what it really means to be a journalist, even though the book is also aimed at a broader audience of news consumers. Although I'm biased since I used to work for Bill and Tom, I think that what they have done here is tremendous, because it is an artful marriage of the core values of journalism and how to keep them alive with a keen understanding of how journalism is changing in the digital age. That is far too rare; most writing on the subject end up as a polemic of one or the other. The majority of old-school journalism academics I know, for example, expound lustily about the importance of accuracy and verification, but they don't acknowledge how the gatekeeping role has changed, how we can look beyond the narrative as a unit to present journalism, how digital tools make journalism BETTER and how we need to think about journalism as a function we provide for communities, not a product. This book also takes a concept that, while critical, can seem kind of abstract to most people - getting it right is key, but exactly how can I be sure I'm doing that - and gives it some precision and clarity. Semua hal di dunia ini pada dasarnya bergerak, tidak statis, tidak ajeg, tidak melulu itu-itu saja. Dunia jurnalisme juga begitu, ternyata. Yang tadinya kita hanya mengenal "jurnalisme sejati" melalui media-media cetak, seiring waktu, kita lalu diperkenalkan dengan yang namanya era baru jurnalisme, yaitu jurnalisme di media siber. Buku ini dari awal sudah mempertanyakan, siapa itu wartawan? Apakah para penulis berita online di internet, blogger, Tuips (pengguna Twitter yang kadang-kadang juga tid Semua hal di dunia ini pada dasarnya bergerak, tidak statis, tidak ajeg, tidak melulu itu-itu saja. Dunia jurnalisme juga begitu, ternyata. Yang tadinya kita hanya mengenal "jurnalisme sejati" melalui media-media cetak, seiring waktu, kita lalu diperkenalkan dengan yang namanya era baru jurnalisme, yaitu jurnalisme di media siber. Buku ini dari awal sudah mempertanyakan, siapa itu wartawan? Apakah para penulis berita online di internet, blogger, Tuips (pengguna Twitter yang kadang-kadang juga tidak kalah serius menyampaikan informasi di Twitland), dan sebangsanya? Bill Kovach dan Tom Rosenstiel datang dengan (bagi saya) pencerahan tentang hal-hal seputar media baru atau jurnalisme baru ini. Lepas dari apakah media di internet bisa disebut jurnalisme ataukah para pelakunya bisa disebut jurnalis, pada dasarnya kita tetap tidak bisa lepas dari 10 elemen jurnalisme ala Kovach dan Rosenstiel, yang disampaikan dalam buku mereka sebelumnya The Elements of Journalism. Di antara belantara informasi yang sangat lebat seperti sekarang, kita mestinya punya saringan tersendiri untuk bisa mempercayai suatu berita. Butuh verifikasi, butuh menguji kelengkapan fakta, butuh melihat bukti, dan apakah kebenaran yang ada di dalam suatu tulisan berpihak pada rakyat, serta bisa dianggap netral juga independen? Blur mengupas hal-hal ini, mulai dari memahami apa itu verifikasi dalam jurnalisme, berusaha skeptis (tidak asal menerima) segala informasi yang datang, sampai akhirnya mengetahui sumber pasti serta bukti jelas tentang fakta-fakta yang tertera dalam sebuah tulisan. Pada dasarnya, kita memang tidak akan bisa lepas dari 10 elemen jurnalisme sepanjang hidup kita. Itulah yang akan menyelamatkan kita dari kebimbangan karena derasnya arus informasi kini. Blur take reader define news product, whether it's true or not from massive flood of information. Compelling book to know deeper how journalism and it's evolving role take place in post-truth era. Nice reading for anyone who have interest in media. The matarial is certainly thought-provoking, especially their examination of the "Journalism of Affirmation" which made me realize how much I, as well as most others, select my sources of information based on the ones with which I agree the most. Whether MSNBC or Fox, such journalists WANT to create an atmosphere of argument rather than the validation of evidence required for the "Journalism of Verification". The strongest point for me is the idea of our OWN responsibility in choosing our sources The matarial is certainly thought-provoking, especially their examination of the "Journalism of Affirmation" which made me realize how much I, as well as most others, select my sources of information based on the ones with which I agree the most. Whether MSNBC or Fox, such journalists WANT to create an atmosphere of argument rather than the validation of evidence required for the "Journalism of Verification". The strongest point for me is the idea of our OWN responsibility in choosing our sources of information. Gone are the days when a Walter Cronkite would verify the news FOR us. Ever since the advent of 24/7 news coverage, the "blur" of information overload has become increasingly overwhelming. I really like the last chapter, which stressed that we should first decide WHAT we want to have information about--and suddenly I was liberated from having to think of news as mainly political. The authors suggest that we should have a list of interests and hone in on deepening our knowledge about and appreciation of THOSE interests--rather than letting the bombardment of media choose for us. And another First Reads win. I was hoping this would address digital media more than it does. The focus of the book is on journalism so the book probably would appeal to journalists and journalism students moreso than other readers. There is some interesting information here but I had hoped for more impact and more readability. "When information is in greater supply, knowledge becomes harder to create, because we have to sift through more data to arrive at it. Confusion and uncertainty are more likely." Bill Kovach and Tom Rosentiel illuminate much about the paradox of an "information age" (or perhaps a Disinformation Age) in which misconceptions and bold-faced lies are more abundant than ever, despite the labors of dedicated fact-checkers. Kovach and Rosentiel's impartial analysis of the problem and its possible solut "When information is in greater supply, knowledge becomes harder to create, because we have to sift through more data to arrive at it. Confusion and uncertainty are more likely." Bill Kovach and Tom Rosentiel illuminate much about the paradox of an "information age" (or perhaps a Disinformation Age) in which misconceptions and bold-faced lies are more abundant than ever, despite the labors of dedicated fact-checkers. Kovach and Rosentiel's impartial analysis of the problem and its possible solution finds matter to blame on both sides of the political shouting match, and offers solutions that don't require you to approve one party or the other. It's worth reading regardless of your political views. Although it's not new (2010), I think their analysis has only become more relevant in the wake of the 2016 election. Rather than simply blaming the usual suspects (internet culture, too much partisanship, too much pretense of objectivity, or individual "bad apples" in the media), the authors particularly note two trends in the news business (both driven by economics rather than policy) that gave free rein to hyper-partisanship, mushy false-objectivity, and outright lies, well before the internet put all of it on steroids. First, cable TV brought the 24-hour news day, promising constant "breaking news!" in place of a nightly news broadcast. It created financial incentives for journalists to immediately report every least suspicion and rumor before they get "scooped" by the competition--a stark contrast to the classic journalistic method of verifying facts, discarding unprovable rumors, and creating a polished, reasoned story that not only revealed news but made sense of it. Fact checkers who call out hoaxes after they've spread can never make up for the lack of restraint before publication or broadcast. Second, cable news stations turned to live interviews rather than recording interviews and embedding them into researched, edited broadcasts that incorporated corroborating (or conflicting) evidence from other sources. Live interviews enable partisans or outright liars to air their talking points unchallenged and unchecked. Efforts to "balance" the effect by pairing interviewees from two opposing viewpoints only leave the viewers with the false sense that all claims are equal, and truth is either subjective or unattainable. Unsure who to believe, many of us (I plead guilty, alas!) turn to the "journalism of affirmation" and select stories that affirm our preconceived views. The rise of internet news makes it easier than ever to read news all day without encountering anything genuinely new or expanding our knowledge in the slightest. The authors' solution isn't easy: in the absence of editing at the production end, every reader/viewer/consumer of news must take on some of the editor's role in order to make sense of an ever-expanding array of information, misinformation, and disinformation. We have to be aware what type of material we're seeing, who it's coming from, how it's verified (and if it's verified), why we should believe it, what patterns it might suggest in the context of other news, what alternative explanation there might be for the data points we see, whether we're getting a complete picture, and what else we might need to find out to get the full picture. Chapter 6 is on "Evidence and the Journalism of Verification". The question here is "What evidence is present, and how was it tested or vetted?" I guess this is when we start using our SS skills. Phil What do you mean by SS? Eustacia Tan Phil wrote: "Also I noticed your review is from a while ago. 3 years later, have you put any of this book into practice? I'm considering this book but Phil wrote: "Also I noticed your review is from a while ago. 3 years later, have you put any of this book into practice? I'm considering this book but unsure how practical it is to implement in a world of info ..."
Recommended and necessary reading for everyone in this digital age. Much of what is discussed in this book is a mix of journalism and information literacy (from the field of library and information science). As a result, the book serves as a field guide to improving our information diets through selecting the best (most credible, complete, and non-partisan) information sources and resources. Everyone can benefit from reading this book. This is a very challenging book and requires a considerable amount of thought and challenges one to the commitment of being a responsible and discerning citizen which requires knowledge, balance, and a desire to explore all facets of an issue and to be aware of one’s virus so as to have a balanced opinion that is not dependent on one point of you. Excellent reading. The authors write a good thesis on the evolution of news gathering and reporting, explaining well our current climate and how we ended up here. They also give good lessons on how to interpret what get from the news and what makes ‘good’ reporting. They also have suggestions for how current news organizations could improve their product offerings. A consumer manual for news consumption, this 2010 title feels timely and necessary. Learn about “The Journalism of Verification” vs. “The Journalism of Affirmation” and what to look for in the news. If this is a scary thought for you, then I encourage you to read Blur, which is both clear and engaging. It offers the reader some tools for understanding ‘news’ today, for being able to dissect stories on blogs, social media, and news feeds, and pull out the kernels of truth. The book opens with an interesting scenario—the nuclear crisis at Three Mile Island is happening today instead of in 1979. The reactor core of the Three Mile Island nuclear power plant in Pennsylvania overheated. How this would be reported today—minute by minute updates with contradictory information from radio talk shows, and completely different spins on different partisan channels (Government cover-up? Political wedge issue on the environment? )—shows you how very different your information world is than that of previous generations. So that you understand what news used to look and sound like, Blur has a quick history of communication—speech, writing, print, telegraph, radio, TV, cable, and Internet. The authors show why you must be skeptical of many (most?) sources of information, and they outline six steps of ‘skeptical knowing.’ This effort to parse information reminds me of one of the important missions of teacher librarians—to teach you how to evaluate sources of information. By calling our current state ‘the age of affirmation,’ the authors mean that many news sources only seek to affirm the prejudices that their audiences already have. They may present actual facts, but those facts are ‘cherry picked’—they leave out any truths that would cause their audiences to question their own beliefs. Kovach and Rosensthiel show you how you can determine if a news source is doing this cherry picking. There is a lot of good information here as well for students who are thinking of careers in journalism. Though much has changed in the last thirty years, there are journalistic values that will always be important. By including snapshots of journalists famous for their brilliant work (e.g., David Burnham), the reader sees how truly valuable research-minded journalists are to society and why this role must continue in the information age. Here again, the authors are helpful, showing how this can be managed and what news sources now and in the future should look like. The author Bill Kovach and Tom Rosenstiel attempt to resurrect good journalism with their book Blur. Both being authors of The Elements of Journalism, this book also has the failing of being as dry as a textbook. However, most of the book has interesting examples of how the government, corporations, and media manipulate the public, and it is our job to be able to identify what is happening. There are different kinds of ways to report a story and if the public can identify what that is, we can be The author Bill Kovach and Tom Rosenstiel attempt to resurrect good journalism with their book Blur. Both being authors of The Elements of Journalism, this book also has the failing of being as dry as a textbook. However, most of the book has interesting examples of how the government, corporations, and media manipulate the public, and it is our job to be able to identify what is happening. There are different kinds of ways to report a story and if the public can identify what that is, we can better decipher the information or identify manipulation. It’s critical with so much information and disinformation being thrown at us to be able to separate the wheat from the chaff. This book can help us do that, but the book can also address concerns directly at journalists rather than the general public. I’ve read other accounts of media manipulation from the Net Delusion to The Filter Bubble. Where those two fail, is where Blur succeeds. It’s the ability to provide tools to decipher the lies and manipulation in a story. Furthermore, it doesn't have quite the dire and cynical perspective about the manipulation, there is something that can be done about it. When it is not attempting to get journalists to go back to their roots, the authors provide examples of key journalists and their investigative techniques. I found these histories fascinating from Homer Bigart’s reporting that changed the way journalists reported on Vietnam (not taking the government’s word for anything) to Seymour Hersh’s reporting (journalism by verification). The authors go on further to identify types of journalism to look for in order to determine if someone is simply stating facts or attempting a journalism of assertion, where facts are picked selectively to prove a point. We have to be vigilant and have “Skeptical Knowing” so that we use our analytical and skeptical mind to find what’s being attempted information or disinformation. In todays rush the facts find the truth later type of news as well as the change the information to suit the political points kind of news it's important to understand the distinctions. It’s also a great analysis of what the news should be, and while much of that is directed at journalists in attempt to turn the ship to best serve the public, it’s a great lesson everyone needs to learn. 1. What kind of content am I encountering? 2. Is the information complete; and if not, what is missing? 3. Who or what are the sources, and why should I believe them? 4. What evidence is presented, and how was it tested or vetted? 5. What might be an alternative explanation or understanding? 6. Am I learning what I need to? One semester of high school journalism (tedious beyond the telling) was enough to drive me away from the admittedly meager interest I had in entering the field myself, though I've remained an avid consumer of the news. In recent years, however, I've been increasingly frustrated and dismayed by what passes as news on cable television and the tenor of the political "discussion" that this news intersects with. So with this layman's interest in the topic, I jumped at the opportunity to read Bill Kova One semester of high school journalism (tedious beyond the telling) was enough to drive me away from the admittedly meager interest I had in entering the field myself, though I've remained an avid consumer of the news. In recent years, however, I've been increasingly frustrated and dismayed by what passes as news on cable television and the tenor of the political "discussion" that this news intersects with. 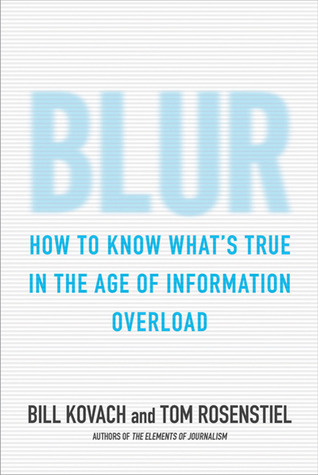 So with this layman's interest in the topic, I jumped at the opportunity to read Bill Kovach and Tom Rosenstiel's Blur: How to Know What's True in the Age of Information Overload. I wanted to take back my news, return to the time I felt secure in the news I was reading, hearing, viewing. In reading Blur, I didn't exactly find security, but what I did find was even better: tools for reading, analyzing, and understanding. This book, written by two experienced and thoughtful journalists, is a dynamic and practical primer on critical thinking and critical interacting. Over the course of the book, Kovach and Rosenstiel demonstrate many approaches to reading, writing, and interacting with news stories, and the book give readers space to figure out what they, personally, need from the news, as well as the tools to develop one's own approach to the news. Despite the hard work this text does, I found it far from dry, and it was not a lecture-type read for me: my copy is well marked-up from my first readthrough, and I'm sure in subsequent rereads, I'll find more to underline and comment on. It encourages thinking, and, like the most useful journalism Blur highlights, "[i]t makes understanding a process, not a product" (179). This attitude is the book's strongest asset: Kovach and Rosenstiel steer clear of telling anyone want to think or even how to think; instead, they provide tools for classifying and understanding the news, examples to illustrate what they mean and how to recognize the techniques being dissected, and they prompt readers to determine, develop, and apply their own critical thinking skills. So, yes. One of the most empowering reads of the year for me. It's a book both comforting (did you know, those paradigm-shaking information revolutions, including our contemporary one, share similar patterns, and the world has never ended due to tension between fact and faith!?) and challenging (my interaction with the news will be less passive from now on, and a lot more personal), and definitely useful. Blur is a great read for anyone who is a journalist, has in interest in journalism, or would like to know more about how news is relayed by the media. We see stories reported minutes after something happens and social media makes it possible to share them in an instant. It’s the responsibility of the public to read past the headlines, and to be able to process and fully understand what we’re reading. “In an age when we are our own editors, in the ‘show me’ versus ‘trust me’ age of information, t Blur is a great read for anyone who is a journalist, has in interest in journalism, or would like to know more about how news is relayed by the media. We see stories reported minutes after something happens and social media makes it possible to share them in an instant. It’s the responsibility of the public to read past the headlines, and to be able to process and fully understand what we’re reading. The book includes a history of journalism and gives many accounts of top new stories, dissecting each one to reveal how the media broke the story, who was involved, and how the community was impacted. You’ll read about the pressures journalists face to keep up with the competition and get the stories out as soon as possible, unlike news of the past where you might have several hours to research a topic. It stresses the importance of finding reliable sources, checking facts, and cross-referencing information. How can we keep up with the changing times without sacrificing the integrity of what is being published or shown on TV? And what do we, as consumers, need to ask ourselves when watching the nightly news or reading the newspaper as we drink our morning coffee? An important part of the book is their discussion of the blurring of media and the importance of knowing the difference between forms of communication and models of content. The authors discuss four models of content: Journalism of Verification, Journalism of Assertion, Journalism of Affirmation, and Interest-group Journalism – and how blogging and social media fit within those models. Reading the book helped me view local news broadcasts and newspapers in a new light. As a person who usually sticks to their “favorite” news station, I find myself wanting to change the channel each night to see how other are reporting the news. What stories are they covering, how are they relaying information, do they appear to be telling the whole story or only what they think we want to hear? I have a new curiosity that makes me want to analyze everything I read or view. Others have described this book as thought-provoking, and I completely agree. The most common criticism of late-20th and early 21st century journalism seems to be that it's not "real journalism" anymore. Kovach and Rosenstiel offer a model which considers that the thing we call "journalism" might not be a monolith. They find historical precedents for 4 different models - a "journalism of verification" which matches that "real journalism" category, a "journalism of assertion" which values immediacy over analysis, a "journalism of affirmation" which presents news in a way m The most common criticism of late-20th and early 21st century journalism seems to be that it's not "real journalism" anymore. Kovach and Rosenstiel offer a model which considers that the thing we call "journalism" might not be a monolith. They find historical precedents for 4 different models - a "journalism of verification" which matches that "real journalism" category, a "journalism of assertion" which values immediacy over analysis, a "journalism of affirmation" which presents news in a way most likely to reinforce the beliefs of its audience, and an "interest-group journalism" in which special interests create content which looks like news to an uninformed viewer. They also recognize a "journalism of aggregation", in which organizations and individuals curate the "news feed" that is interesting to them. While the bulk of the book talks about the first 3 models, and how to recognize and analyze them, the real theme of the book might be the last category. Individuals have increasingly accepted more of the responsibility for collecting their own varied sources of news, and the broad journalism industry has responded in logical ways to stay in business. If we are all becoming "aggregators" in one sense or another, we need to understand the different kinds of journalism, and know how to evaluate them (as what they are, not what we wish they were). Sekarang, informasi datang berlimpah ruah. Tak hanya dari media arus utama, seperti TV, koran, majalah, dan semacamnya. Arus informasi itu justru datang dari banyak media yang diproduksi sendiri oleh warga, jejaring sosial. Maka, tantangan baru pun muncul. Jika sebelumnya susah mengakses, saat ini konsumen informasi justru kebingungan menentukan, manakah informasi yang bisa dipercaya dan mana yang tidak. Buku ini memberikan panduan bagaimana konsumen informasi bisa mencari informasi mana yang lay Sekarang, informasi datang berlimpah ruah. Tak hanya dari media arus utama, seperti TV, koran, majalah, dan semacamnya. Arus informasi itu justru datang dari banyak media yang diproduksi sendiri oleh warga, jejaring sosial. Buku ini memberikan panduan bagaimana konsumen informasi bisa mencari informasi mana yang layak dipercaya. Panduan tersebut dilengkapi analisis dan contoh-contoh dalam menguji informasi. Pengujian bisa tidaknya informasi tersebut antara lain dengan (1) mengetahui informasi apa yang sedang kita baca, (2) menguji sumber informasi, (3) menilai bukti yang diberitakan, dan (4) memeriksa ulang apakah kita sudah mendapatkan informasi yang kita butuhkan. Mereka juga memberikan tawaran bagaimana jurnalisme di masa mendatang sebaiknya dibentuk. 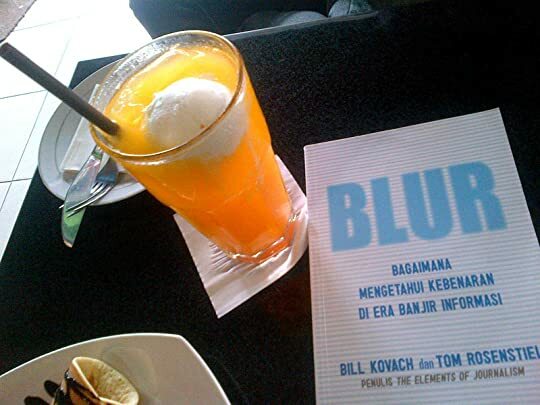 Penulis buku ini Bill Kovach dan Tom Rosenstiel, dua begawan jurnalisme dari Amerika Serikat. Keduanya mengelola Committee of Concerned Journalist yang bertujuan meningkatkan kualitas jurnalisme saat ini. Dengan pengalaman puluhan tahun, mereka memberikan analisis dan contoh-contoh relevan dalam khazanah jurnalisme saat ini meski hampir semua contoh tersebut dari Amerika. Buku ini lebih tepat dibaca oleh konsumen informasi, terutama mereka yang saat ini lebih banyak menggantungkan diri pada internet sebagai sumber informasi utama. Meski demikian, jurnalis, blogger, mahasiswa, atau siapa pun yang berminat dengan kajian jurnalisme saat ini. "How to know what's true in the age of information overload", is the enticing subtitle of this book. However, reading this book will not make you an expert in identifying a story that is prejudiced, or embellished or even untrue. It does give you some pointers to help you identify what is true and what is not. Be skeptical. And don't just accept a statement because it happens to agree with your beliefs. The news cycle can be daunting so choose your sources carefully and question whether the news "How to know what's true in the age of information overload", is the enticing subtitle of this book. However, reading this book will not make you an expert in identifying a story that is prejudiced, or embellished or even untrue. It does give you some pointers to help you identify what is true and what is not. Be skeptical. And don't just accept a statement because it happens to agree with your beliefs. The news cycle can be daunting so choose your sources carefully and question whether the news account is complete and if not find out what other sources can add. There are many new forms of communication and we can use them for information if we examine them and see if everything they say points in one direction. Blogs and social media need to be filtered. Editorials comtemplate the news and we expect an opinion but it is spin if it is not based on factual information. The authors suggest teaching "civic literacy" in school so that ALL people can develop "skeptical knowing". Very informative, interesting account of how news has changed over time and how we are now in charge of deciding what news is accurate and which "news" might not really show the whole picture. Most of it was just common sense: noticing if the reporter had sources for information, whether those sources were good sources or not, looking for news which connects the story to a broader picture, that kind of thing. What I liked was that it also gave ideas of how journalism should morph in this modern Very informative, interesting account of how news has changed over time and how we are now in charge of deciding what news is accurate and which "news" might not really show the whole picture. Most of it was just common sense: noticing if the reporter had sources for information, whether those sources were good sources or not, looking for news which connects the story to a broader picture, that kind of thing. What I liked was that it also gave ideas of how journalism should morph in this modern era of new technology, so that it uses the new technology to its advantage yet upholds a strong conviction to accuracy in reporting. The authors gave a lot of good examples to back up their advice. I feel that for all the emphasis they made on editing they should have perhaps edited it a bit more because I found several grammatical errors and "the the" occurred at least once in the book. Mostly it made me sad for how far journalism has fallen in such a short period of time. There are still good journalists out there but most "news" seems to just be opinions these days. It did not make me want to read the news more as I already feel that people become misinformed by the news more often than not if they are not extremely skeptical. The book starts off with an intriguing premise, following how news and information is transmitted following a nuclear disaster. Intriguingly,we find that the anecdote provided was mostly true, taken from real stories surrounding the Three Mile Island accident. Using TMI as a starting point, the authors begin to discuss how news dissemination and journalism have changed in the age of digital information that has arisen since TMI. The authors really care about the quality of journalism and prescri The book starts off with an intriguing premise, following how news and information is transmitted following a nuclear disaster. Intriguingly,we find that the anecdote provided was mostly true, taken from real stories surrounding the Three Mile Island accident. Using TMI as a starting point, the authors begin to discuss how news dissemination and journalism have changed in the age of digital information that has arisen since TMI. The authors really care about the quality of journalism and prescribe several solutions for the new era of journalism. In particular, in an age of multiple information sources, people are looking for news functions beyond the traditional investigative reporting as we seek to authenticate and understand what is going on. As an afterward, we can now see the real world reaction to a nuclear disaster due to the events of Fukishima in 2011. - What might be an alternative explanation or un This book was...well, OK. I bet it would be interesting if you were interested in journalism or journalistic ethics. Bill Kovach and Tom Rosenstiel. NY: Bloomsbury, 2010. 227 pages. The book discusses some of the changes in the news field subsequent to the development of the internet - that is the change from a reliance of newspapers and hard copy to getting your news from the internet. 4. Completeness: What Is Here and What Is Missing? 5. Sources: Where Did This Come From? 7. Assertion, Affirmation: Where's the Evidence? 9. What We Need from the "Next Journalism"
I have been looking for a book on this subject, i.e., how to vet things we hear and see. The authors have great backgrounds for this. We will see. The book is about analyzing the news in the light of journalism (if indeed there is any journalism in most of the news). I am more than disappointrd in the names partisans use for their different catagores. I learned that buzz words such as "Obama Care" and "Death Tax" instead of Health Care and InheiratenceTax, are actually printed on wallet size card I have been looking for a book on this subject, i.e., how to vet things we hear and see. The authors have great backgrounds for this. We will see. I learned that buzz words such as "Obama Care" and "Death Tax" instead of Health Care and InheiratenceTax, are actually printed on wallet size cards to give to their partisan members. I hate hearing such words when not inactual quotes. Give me news that has been vetted and tell me how it was vetted, and let me make up my own mind about it.